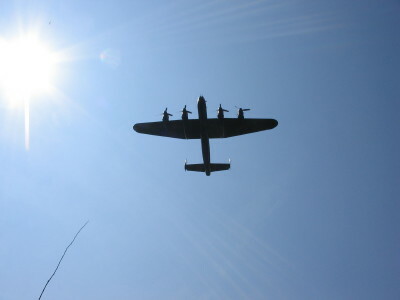 Henry Philip Morrison was a Flight Engineer on a Lancaster bomber. 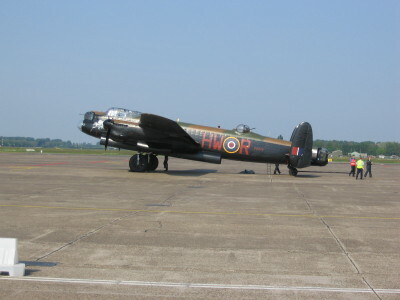 He was assigned to the 170th Squadron whic was stationed at Hemswell, Lincolnshire. They reached the target and dropped their bombs but on the way back things went wrong. They had just passed over what appeared to be a number of searchlights on the ground in the shape of the spokes of a wheel when the aircraft was engaged and held y two searchlights. It was 23.20 and they where flying about three miles east of Venlo. The weather conditions where excellent, which meant that there were no clouds where they could hide. Lt. Coderre dropped ?window? in an attempt to mislead the flak control, but it would not help. The searchelights douced and right after that the aircraft was hit by a burst of flak which exploded just below the port of the fuselage. That first hit destroyed the radio equipment as well as the intercom on board. A second burst followed almost immediatly after the first. It scored a direct hit on the inner engine on portside which caught fire. Henry Morrison used the Graviner fire extinguiser while Lt. Coderre feathered the engine. The communication between the two man was hindered by the broken inter-com. Their actions seemed to have stopped the fire but after a short while the fire increased and spread tot the outer port engine. The aircraft started to dive towards the port side. Lt. Coderre then shouted to his men to put on their parachutes and abandon the aircraft. The men rushed to the escape hatch in the front of the aircraft. The Bomb Aimer, Flanigan grabbed the hatch and tried to open it. The wind pressure jammed the hatch. A few moments later the men where able to open the hatch and Henry Morrisson, Flannigan, Lewis, Cooper and Mac Innes where able to bail out wearing their chest parachutes. 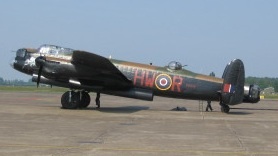 The pilot waited a minute and was preparing to bail out as well when the rear gunner Flight-Sergeant Paterson appeared in the cockpit. He had no parachute with him. Lt. Coderre told Paterson to go back and get it while he would continue flying the aircraft. Then suddenly a german nightfigher appeared on starboard side behind them. Lt. Coderre had to dive in an attempt to get rid of the fighter. At that time the rear gunner Paterson reappeared in the front of the aircraft wearing his parachure. The sudden dive threw him off balance and he hit his head on the instrument panel. The blow knocked the gunner unconsious. Coderre saw it happen and jumped from his seat to grab tPaterson. Although he got hold of his flightclothing he could prevent them from falling both through the open escape hatch. Patersons parachute did not open. Lt. Coderre mad a save landing on the ground. After both had fallen from the aircraft, the Lancaster itself exploded. It was around 23:33 when Lt. Coderre landed. 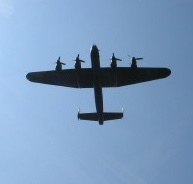 They where flying over southern Holland at that time. American soldiers saw the tragedy unfold above them in the air. Lt. Coderre came down on a road ½ mile east of Weert 500 yards from a farmhouse. The farmer came towards him shouting ?Kamarad Nederlander? and he brought him in his home and gave him food. Since the pilot has lost his boots on his decent from the aircraft he asked if the farmer could contact allied troops in the area. The farmer did so an the pilot was picked up by a jeep. He was brought to an officers club in Eindhoven, where the Flanigan joined him later in the day. Morrison, Mac Innes and Lews where not so lucky. They came down in the trees and where hospitalized in Holland. Paterson and Cooper did not survive. Henry Morrison was later transported back to his squadron in the UK. 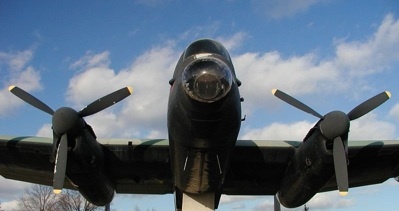 On 29th April 1945 Henry flew his first food drop mission for the starving people of western Holland. The target of that day was The Hague. He flew three more food drop missions to Rotterdam on 1/5/1945, 3/5/1945 and 7/5/1945. 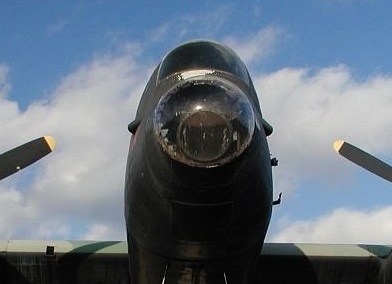 The escape hatch in the front of the bomber right after the seat of the bomb aimer.